& BSF reached at his hiding place near Bassi Pathana Distt Patiala Now in ( fatehghar Sahib). All of his weapons were stolan by the police cats before. He only had a Pistol And 6 Rounds. On that farm house he was alon and old woman who was mother of the owner of that farm house was there she her family was also with police to make money. while police and commandos were take their positions he was doing nitnem in his bunker type room. Then That Old woman called him and she asked him to set the TV antenna on top floor of the house when he went their to set the antenna he saw police around. They Police opened the Fire on him he got shot in the right side of his chest he run back to his bunker to took his arms to fight with them when he saw there was no any weapon left he realized that everyone is sold to the police. He took his pistol nd take his position in his bunker when the police entered in house he opened the fire of his pistol. He only have six rounds. He did not want to waste a singloe bullet where it was very valuable. With his fire two of the police man were killed and one was one was injured. Now he had no any other bullet left. and he was seriously injured because he got bullet on his chest before. After Some time when no any fire came from his side police start firing heavily they understand that he was injured or he had no other bullets / ammos. They Captured him. But there is mystery of His Shaheedi someone said that he was Shaheed in this encounter But others says that he was captured and then tutored by police then got Shaheedi on next day. He had a very high jeevan he follows the maryada of Bibeek thats way he was known as Bibeeki Singh also. He was A good athlete also while he was studying in Punjab Agricultural University, Ludhiana He got Gold medal in 3000 meter running. He was good player of hockey also. Bhai Ajegurpreet Pal Singh alias Babeki Singh was born in the year of 1964 in the house of Master Dhian Singh and from the womb of Mata Gurmej Kaur, in the village of Pendi Sura Singh, district Hoshiarpur. A short while after Bhai Sahibs birth the family moved to Garhshankar, where Bhai Sahib completed his primary education. Bhai Sahib then studied up till +12 class at Government Senior Secondary School of Garhshankar. From his childhood Bhai Sahib was keen in studies and active in sports. To get even higher education Bhai Sahib took admission into Punjab Agriculture University in Ludhiana. During this time the greatest Sikh of 20th century, Sant Jarnail Singh Ji Bhindranwale was preaching equality amongst the masses and waking Sikhs up from the deep sleep of slavery. While studying at Punjab Agriculture University in Ludhiana, Bhai Sahib started visiting Sri Darbar Sahib to attend the speeches of Sant Jarnail Singh Ji Bhindranwale, during this time Bhai Sahib took Amrit at Sri Harmandir Sahib. Bhai Sahib started following the Maryada of Babek. The attack on Sri Darbar Sahib by the Indian government had a deep impact on Bhai Sahib. It was at PAU that Bhai Sahib joined the All India Sikh Student Federation and then slowly established a contact with Khalistan Liberation Force. Soon Bhai Sahib started taking part on actions but secretly. Bhai Sahib also made a contact with the singhs of Bhindranwala Tigers Force of Khalistan. Bhai Sahib was an excellent athlete. Bhai Sahib was awarded a gold medal in 3000metre running on a national level at the All India University Games. Bhai Sahib was also a great player of hockey. After completing his studies Bhai Sahib started work in Patiala at a company of Captain Amrinder Singh. For a short while Bhai Sahib stayed a Patiala and after that Bhai Sahib took on a government job as a District Inspector of Diary industry. This job was based in Hoshiarpur near his village, Bhai Sahib was known as a hard working honest man. With his wages Bhai Sahib would share amongst the shaheed families and the remainder was given to the singhs involved in the armed struggle. As Bhai Sahib worked in Balachor regularly, Bhai Sahib met a singh of Bhindranwala Tigers Force of Khalistan (Sheena Group) Bhai Satnam Singh Sheena. Because of Bhai Sahib’s intelligence and honesty he was known as the brains of the group. Soon looking at Bhai Sahib’s sewa within the movement he was made Lt General of Bhindranwale Tigers Force of Khalistan. On many occasions Bhai Sahib escaped unharmed from fierce battles against the Indian security forces. To preach the message of free Khalistan, Bhai Sahib organised many conventions in his area which were attended by Sardar Simranjit Singh Mann and Baba Joginder Singh Rode. By now the police were laying traps to arrest Bhai Sahib. Once as Bhai Sahib went to Anandpur to do darshan of Sri Kesgarh Sahib but due to a betrayal of another person he was arrested by the police on the steps of Sri Kesgarh Sahib. Bhai Sahib was blindly tortured by the police but even then he never spoke a single grain of word against his Jathebandi. Because Bhai Sahib was a Bebeki Singh, he faced many difficulties in jail. For a while Bhai Sahib did not eat in jail and with the running around his father, Sardar Dhian Singh the courts allowed Bhai Sahib to have his own stove and groceries in jail. Soon Sardar Dhian Singh managed to get Bhai Sahib released on bail. Bhai Sahib now left home and went underground permanently. Bhai Sahib had started doing even bigger actions. Bhai Sahib’s younger brother, Bhai Gurlaat Singh Fauji was the area commander of Hoshiarpur and together both brothers eliminated gangsters, thieves, black cats and rapists from Hoshiarpur. Sikh girls that were forced by their in laws to provide dowry, Bhai Sahib punished the in laws and rehoused the girls with their husbands. No Shiv Sena supporters or criminals could be seen in the Hoshiarpur and Nawashaher area. Bhai Sahib located a fake Saadh Balwant Singh who would dress up like Guru Gobind Singh Ji Maharaj with a Chola, Kalgi and disrespect Guru Maharaj. Short time after when the fake Saadh Balwant Singh came to Balachor for a Diwan. Bhai Sahib prioritised the respect of Sri Guru Granth Sahib Ji and made his way to Hell. Bhai Sahib walked right close to the Saadh, he shot many bullets into the body of the Saadh and sent him to hell. Every village of Punjab would talk about the bravery of Bhai Sahib. The in 1992, the government of Butcher Beanta came into power and many Sikh youths were being killed all over Punjab. Even the brother of Bhai Sahib, Bhai Gurlaat Singh Fauji was also made shaheed by the black cats of the police. Bhai Sahib planned a mission to assassinate the chief minister of Punjab, Butcher Beanta. Bhai Sahib along with fellow singhs carried out the action by attempting to blow up Butcher Beanta at the Secretariat of Chandigarh. Unfortunately Butcher Beanta survived the bomb blast. The Indian secret agencies upped their game to capture Bhai Sahib. Then a close relative of Bhai Sahib revealed the secret hideouts of the singhs to the police. A farm house in the village of Bassi Pathana, district Patiala (Now in Fatehgarh Sahib) where Bhai Sahib was staying with an old Mata was surrounded by Indian security forces in joint operation with Border Security Force on the morning of 24th August 1993. At that time, Bhai Sahib was on the top floor of the house because the old Mata called him and she asked him to set the TV antenna on top floor of the house when Bhai Sahib went there to set the antenna he saw police closing in on him. The Indian soldiers under the command of DSP Gurdev Singh started raining bullets upon Bhai Sahib. Bhai Sahib quickly tried to move towards his room in which he had kept his weapon. At that time Bhai Sahib only had revolver and limited bullets. As Bhai Sahib moved towards his room he was shot in his right shoulder, but he managed to reach his weapon and a battle started from both ends. Bhai Sahib killed two officers as soon as they entered the house and injured one. Due to Bhai Sahib having limited ammunition, Bhai Sahib was out of bullets and on the other side the unlimited supply of bullets to the Indian soldiers proved to be lethal as they ripped through the chest of Bhai Sahib as he attained shaheedi. The following day the front pages of newspapers read the headline, ‘Bhindranwala Tigers Force’s Khadku, Bhai Satnam Singh Sheena’s right hand killed in fierce encounter.’ The family only found out about Bhai Sahib’s shaheedi by reading the paper. The police did not give the dead body of Bhai Sahib to his family. 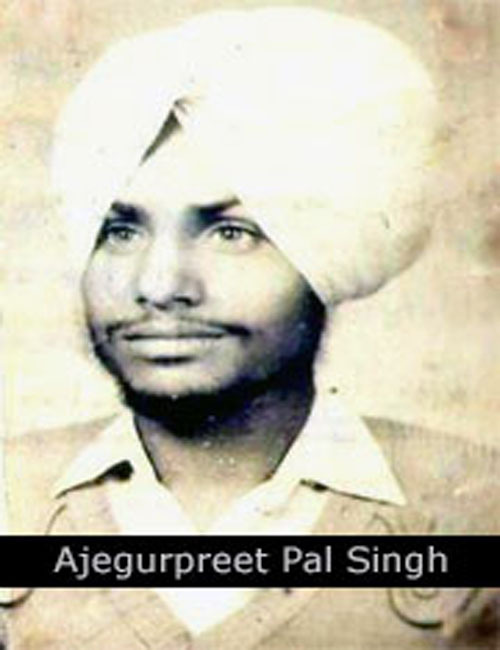 In the Sikh armed struggle another 3 brothers of Bhai Sahib attained shaheedi, Shaheed Bhai Gurlaat Singh Fauji (Area Commander BTFK), Shaheed Bhai Balbir Singh who was only 15 years old (Both of these singhs were the sons of Bhai Sahib’s Bhua) and the younger brother of Bhai Sahib, Shaheed Bhai Paramgurpreet Pal Singh Punia, who was in Germany and after came to Pakistan and joined Khalistan Commando Force under the command of Bhai Paramjit Singh Panjwar. After getting all his training, Bhai Paramgurpreet Pal Singh jumped into the battlefield and due to the traitors of the Sikh panth, he was arrested and made shaheed in a fake encounter.